Just recently announced, the Canon Pixma MX850 is an all-in-one printer for your home or small office. 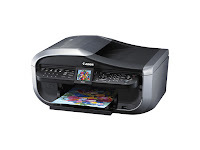 Since it IS an all-in-one printer, expect the Canon Pixma MX850 to be bulky, but its design is sleek and curvy. The Canon Pixma MX850 has printing, faxing, scanning, and copying capabilities, and a built-in Ethernet port so you can share it throughout your home or in your office. It also has an automatic document feeder so you can scan both sides of a document. What might make the Canon Pixma MX850 a printer worthy of your office is that it can scan and print at the same time so using it in conjunction with the automatic document feeder means faster copying and scanning of files. The Canon Pixma MX850 would be a great investment rather than buying a separate copying machine if your office or home only needs few documents copied once in a while. There's also no need to attach the printer to your PC in order to crop scanned images as you can erase frames around the scanned document right on the Canon Pixma MX850 control panel, thanks to its large 2.5 inch LCD display which can view scanned documents. Aside from being mainly for office use, the Canon Pixma MX850 can also be a powerful photo printer. Canon has incorporated its five color individual ink system on this all-in-one-printer so it is capable of resolutions up to 9600 x 2400 color dpi. The Canon Pixma MX850 also allows you to directly print your pictures straight from your memory cards or PictBridge compatible digital cameras. With all that features and if Canon stays true to their claims: Quickstart feature that will allow you to start using the Canon Pixma MX850 in a matter of seconds and their claimed 21 second print speed for a 4 x 6 borderless colored photo, then the Canon Pixma MX850 will be a welcome addition to any home office. Shop CNET to compare Printers specs and prices side-by-side. I have had the MX850 for about a week and am quite happy with it so far. I am not sure what Canon is talking about with the quick start up time, as it takes longer to warm up than my old HP6310. Print times are good. Software is just fair. Print quality (text and pictures) is excellent. The ability to have two separate types of paper fed is very nice. The printer is a bit bulky, especially in depth. I'm also interested in buying it. How long does it take before the printer starts printing? Does it support turn-on/off-on-demand? I could turn off my old i550 from Canon and it automatically turned on when sending a print job to it. Also automatic turn-off worked with this one. What about the MX850? Heard that it uses the 3 colors to mix black when it comes to duplex-printing. Can you confirm that? I can't really confirm anything because I don't own this printer--yet. Anyways, this is just an overview of the MX850's features. Maybe Mike could answer your question. I'd love to hear if you've tried this. Unfortunately, I don't own this printer. I hope somebody who owns this might be able to help you.